Nashville, TN is unlike any other city around – blending southern charm, country western feel, and funky scene into one fun city. 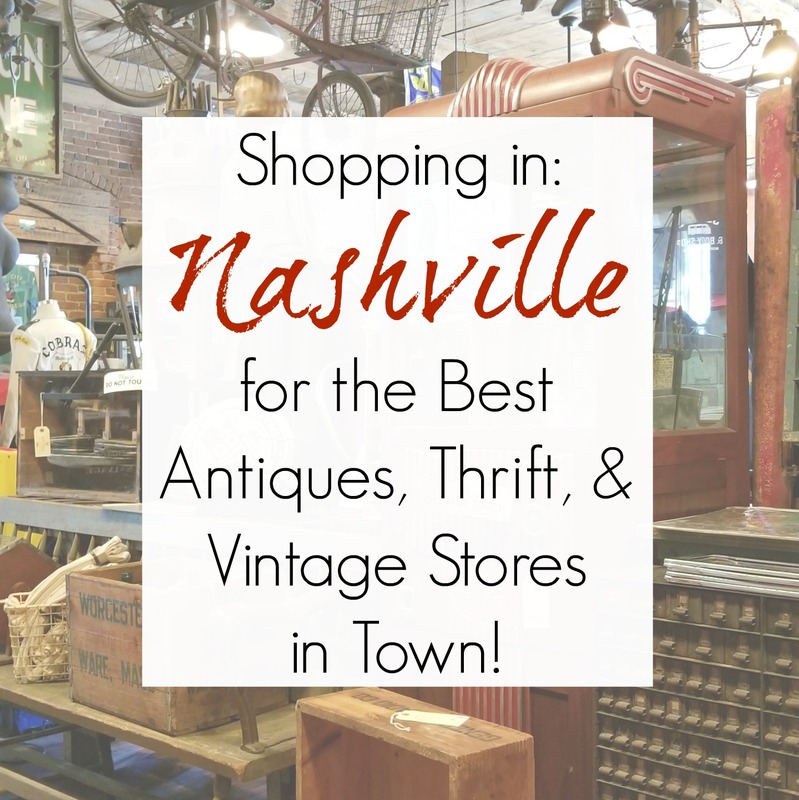 But when I visit Nashville, I have one specific goal…to hit up the best antiques, vintage, architectural salvage, and thrift stores in town. And whenever I visit Nashville, I always combine it with a brief jaunt south to Franklin, TN, as well. Even more junkin’ bang for my buck! But I won’t digress any further. 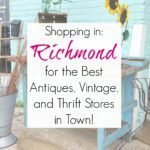 If you’re heading to Nashville, TN and want to hit some great secondhand shops, let me steer you in the right direction! For someone like me, Preservation Station is worth a trip to Nashville alone. 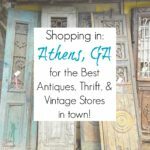 It is one of my all-time favorite architectural salvage stores that I’ve ever been to. Walking around Preservation Station feels like you’re creeping through the most amazing abandoned castle, surrounded by incredible pieces of reclaimed history. Promise me you’ll check it out, ok? 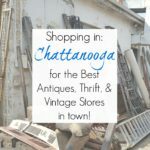 If you love HUGE thrift stores, then you’re in luck because Nashville, TN has several of them! And Music City Thrift should definitely be on your thrifting list when you’re in town. Racks and racks of clothing and countless shelves of housewares greet you as soon as you walk in the door. I couldn’t NOT check out this antiques store while I was in Nashville. Long before we got rid of cable TV, I was a huge fan of American Pickers. And while there were no celebrity sightings while I poked around the store, there was a lot of “junky” eye candy to enjoy. Of all the thrift stores that I visited, this one was the smallest but perhaps the sweetest, if that makes sense. It was pleasantly crowded and everyone seemed to know each other and chat about their treasures, which I found charming. The clothing section seemed to be everyone’s favorite as I was mostly alone in housewares, so perhaps they knew something I didn’t know? Now, if you’re looking for furniture, antique glassware, or other high end treasures, then this is NOT the shop for you. But if quirky retro treasures with a dash of pleasantly weird and peculiarly nostalgic is more your speed, then get thee to Rusty Rats. And I say that all as a compliment…being “pleasantly weird” myself. One of the other HUGE thrift stores in Nashville, TN that I really enjoyed was ThriftSmart. It had a fantastic supply of furniture (and some vintage pieces that I lingered over) and an even better housewares department. In fact, I hardly thrifted any treasures on this trip, but the ones I found came from this thrift shop. Now, there are a few other notable shops that I hit in Nashville but didn’t get quality photos of. I checked out a couple of additional antique malls but truthfully, they weren’t really all that memorable. I did, however, check out Southern Thrift Store, which was the third of the huge thrifts that I discovered. They display housewares on top of clothing racks which is hard for a short person (like me) to easily peruse and photograph. But don’t let that stop you from checking it out! I’ve also heard great things about the Nashville Flea Market, but alas…I was in town on the wrong dates. But if you’re planning a trip to The Music City, you may want to take the Flea dates into consideration. 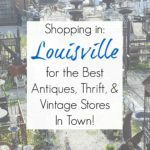 If I missed any of your favorite shops in Nashville, please do let me know! 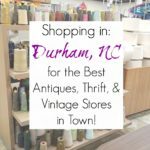 I try to check out as many stores as possible on these junkin’ journeys, but I have been known to miss or overlook amazing stores. And I’ve been junkin’ in other places, too- check out all the places I’ve traveled to here and start planning your own junkin’ journey! Merci Béatrice! J’aime que vous lisiez au sujet de mes aventures en Amérique. J’adorerais faire du shopping d’antiquités en France mais c’est loin pour moi! Nous rêverons donc tous les deux, oui? I used to visit any shop that was second hand; not so much anymore. I moved to a very small home (surprised me and all who know me) with very small space, so, nothing crowded. Therefore, when something catches my eye, I have to really think it thru and ask myself a gazillion questions. If it’s a keeper, then something at home has to go (involves thinking thru, again), always to a worthy thrift store, such as @lovinghandsthriftstore in Bradenton FL. But, all that to say, antiques bring back loving memories of when I decorated my larger home with them, and of the special friends in my life who thought of me when they, too, saw antiques. I’m heading to Hendersonville/Asheville (and visiting Greenville, too) soon for a month, look out shops, here we come! 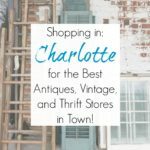 My junkin’ journey blog posts on Henderson and Asheville are outdated and I plan to update them soon, otherwise I’d send them your way! I’ve gotta know…. at This’n’that…. what is the large wooden/brown item on the top shelf in the middle of the photo ? It was an unusual rocking chair! (I think it was broken, which is why they had it up there and not on the floor). Thank you for this great info. Put on my bucket list! You are so very welcome, Marie! I wish you had given us a preview of your treasures; I hate having to wait until you have transformed them into something really neat! I often share them on my blog’s Facebook page or Instagram stories! I live about one hour from Nashville and love it. thanks for giving me different places to visit. It looks like you had a great time! I love seeing your great photos and the links to the shop webpages is much appreciated! I need to go to Nashville!